It’s not everyday I jump out of my seat yelling, “Holy Crap”, after seeing a new product. 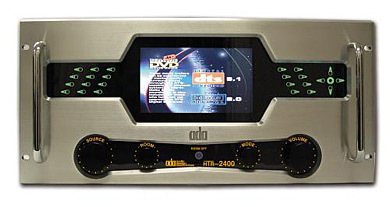 This just happend… check out ADA’s new HTR-2400 Home & Theater A/V Receiver. The HTR-2400, which officially begins shipping this August, combines an eight-zone ADA multi-room system with a ninth zone ADA home theater system. 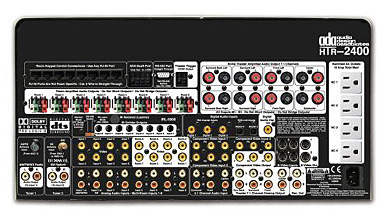 Amazingly, the HTR-2400 also includes twenty-four channels of power amplification. And as if that were not enough, the HTR-2400 also features dual internal tuners, an AM/FM/WX (Weather Band) tuner and XM Satellite Radio tuner also making it the first A/V receiver to include XM on-board. The HTR-2400 is available in several versions; from a blank-plated front panel design starting at $9999 to the pictured version that features a ½ inch thick aluminum front panel, 16 x 9 color LCD preview monitor, control knobs and transport buttons ($11,999). The control knobs make operation of the HTR-2400 extremely easy. To select a room including the theater zone, turn the room knob. To engage an input to that room, turn the input knob and then press it. To adjust volume, turn the volume knob. For the theater zone, turn the mode knob to change surround sound modes. To turn off a room, press the centered “off” button and to turn off the entire home, press and hold the “off” button. The HTR-2400’s display will preview video sources playing to the theater zone and will also popup an on-screen GUI that indicates everything from zone status, party groups, and setup options. There is even a page that displays the activity of the entire home. Motorola’s All-In-One HDTV Surround Sound Receiver, Literally!